It is important to remember that the Presidents’ request is simply a proposal and is unlikely to become law. Congress has sole authority over appropriating funds. COSSA has signed on to a letter to Congressional leaders as part of the Coalition for National Science Funding (CNSF) encouraging Congress reach a bipartisan agreement to raise the budget caps for non-defense discretionary spending and recommending an increased appropriation of $9 billion for the National Science Foundation in FY 2020. 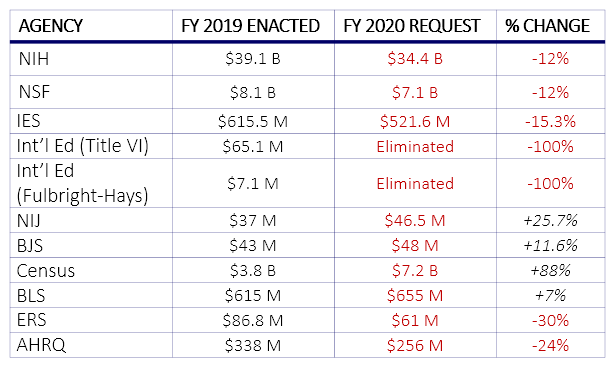 Before Congress can fully dive in to the FY 2020 appropriations process (see related article), it must address a larger threat facing funding for next year. As COSSA has reported, the Budget Control Act of 2011 put in place caps on discretionary spending for every year between 2013 and 2021, which limit how much Congress can spend every year with an aim of reducing the federal deficit. Thankfully, Congress took action since 2013 to amend the law and raise the caps, which has allowed funding for federal research agencies to increase above the painful caps. Unfortunately, the relief enacted by Congress expires in FY 2020, meaning if Congress does not act this year to provide relief (to “raise the caps”), these draconian spending limits will be back in force and translate to devastating cuts to programs important to our community. In response, COSSA has issued an action alert urging members to write to their Members of Congress to tell them to prioritize a budget deal that gives fair treatment to vital non-defense discretionary (NDD) programs—including science and research agencies—which have disproportionately borne the brunt of federal spending cuts over the past several years. The action alert can be found on COSSA’s website. In response to a Federal Register request, COSSA submitted a comment to the White House Office of Management and Budget (OMB) requesting that, should a Census citizenship question be reinstated by the Supreme Court, as has been proposed by the Trump Administration, OMB remove it from the 2020 Census on the grounds that it violates the Paperwork Reduction Act. COSSA argues that including the question “is of minimal practical utility or public benefit, will increase the burden on respondents, and will harm the integrity and accuracy of information collected for statistical purposes.” The full comment is available on the COSSA website. In a Dear Colleague letter released on March 18, the National Science Foundation (NSF) invited interested parties to participate in the NSF Convergence Accelerator Pilot. The NSF Convergence Accelerators Pilot seeks to accelerate use-inspired convergence research in areas of national importance by facilitating convergent team-building capacity around exploratory, potentially high-risk proposals. The Pilot seeks proposals to support fundamental research while encouraging rapid advances through partnerships that include, or will include, multiple stakeholders in three research tracks aligned with two of the NSF Ten Big Ideas. The three research tracks are: Open Knowledge Network (as part of the Harnessing the Data Revolution Big Idea), AI and the Future of Jobs (as part of the Future of Work at the Human-Technology Frontier Big Idea), and National Talent Ecosystem (as part of the Future of Work at the Human-Technology Frontier Big Idea). The submission of a Research Concept Outline is due April 15, with full proposals due by June 3. NSF will host two webinars, on March 27 and April 3, to answer questions about the submission process and the Convergence Accelerator program more broadly. More information about the Convergence Accelerator program is available on the NSF website. On March 13, William Beach was confirmed as the next Commissioner of the Bureau of Labor Statistics after a protracted wait. Beach was originally nominated by the Trump Administration in October 2017 (see COSSA’s previous coverage). He is an economist who spent much of his career at conservative think tanks and was most recently Vice President at George Mason University’s Mercatus Center. He also spent several years as Chief Economist for the Senate Budget Committee Republican Staff and has been involved in the evidence-based policy-making activities of the last several years. The Friends of BLS, of which COSSA is a member, endorsed his nomination. He succeeds William Wiatrowski, who has been Acting Commissioner since January 2017 when Erica Groshen’s term expired. Beach will be tasked with leading the Bureau as it faces the relocation of its headquarters and a potential move from the Department of Labor to the Department of Commerce. On March 5, the Board on Behavioral, Cognitive, and Sensory Sciences of the National Academies of Science released a Consensus Study Report of the Decadal Survey of Social and Behavioral Science for Applications to National Security. A decadal survey is a method of engaging members of a scholarly community to identify lines of research with the greatest potential to be used over a 10-year period in pursuit of a particular goal. This is the first decadal survey to attempt to set a research agenda for the social and behavioral sciences or the intelligence community. The report, A Research Agenda for Advancing Intelligence Analysis, recommends that the intelligence community make sustained collaboration with research in the social and behavioral sciences as a central part of the 10-year research agenda. The report highlights ways to promote interdisciplinary collaboration so that the insights from social and behavioral science research are more fully integrated with the needs and objectives of the intelligence community. The report also includes opportunities for social and behavioral science research to help strengthen, plan, and design intelligence analysis. The full report can be read on the National Academies’ website.